I have a hexapod that a friend and I built this summer, but there is a big problem whenever we try to move multiple servos. 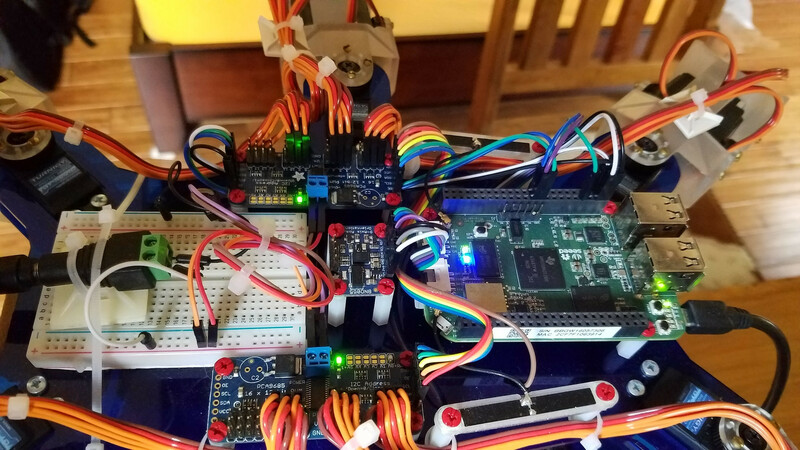 When using the Adafruit_Python_PCA9685 library, I am able to move the servos perfectly fine for a short period, but then they will breakdown and start erratically twitching. To illustrate the problem, I just modified a few lines from Adafruit's simpletest.py program. I am running the code on a Beagle Bone Green Wireless with ubuntu on it and I am using turnigy TGY-S091D servos. I don't have enough reputation to post more detailed pictures, but hopefully this is enough. The movement you are seeing is what I would expect to see if your ground was rising becouse of current draw. Basically as you turn on more servos you will see there current draw will make the apparent voltage drop and the pulses for PWM grow more indistinct, digital servos will generally still work ok but analog servos like you have will stutter as you show. You should avoid breadboards when working with circuits subject to significant currents or vibration. That said - the power side of the servos (centre wire) can and should be supplied by a private and isolated supply. The arduino has its own on-board regulator but that is limited to under 500mA. If you are driving the servos directly from the arduino then when your servos are working they are drawing too much current, resulting in a voltage drop which is interfering with the signal. The second issue may simply be circuit noise. All brushed motors are digitally noisy - that noise appears as spurious signals on the supply rail which can interfere with high frequency MCUs for example. If circuit noise is suspected - an oscilloscope on the arduino supply rail will show the problem. Often a simple capacitor (0.1uF) to ground is sufficient to attenuate the noise. The solution is to use a BEC (Battery Elimination Circuit) which isolates the power used by the BEC connected devices, in this case your servos, from other devices connected to the same battery. With the BEC in place and supplying power to the servos, the ground connection must be common with the control signal ground and the power ground. The control signal is therefore independent of the servo supply voltage and is always referenced to the arduino ground. Not the answer you're looking for? Browse other questions tagged rcservo python beagle-bone or ask your own question.